People always ask me one of these three questions when it comes to healthy eating and planning my meals. 1.When do I find the time to cook? 2. Isn’t eating healthy really expensive? 3. How do I decide upon my weekly meals and do I get tired of eating the same things? I will address each question separately. 1. When do I find the time to cook? Honestly, I have to make the time. We all lead busy lives and have hectic schedules that require most of our time. I knew if I wanted to remain healthy and maintain my weight loss, I had to pencil in cooking and going to the grocery store somewhere on my to do list. I usually grocery shop on Saturday and Sunday is the day in which I meal prep because it’s my least hectic day and it helps prepare me for the beginning of my work week. Most of us lead routine lives where we get up the same time every day to go to work and come home tired and mentally drained. Our daily schedule rarely changes unless there’s some challenges thrown our way. We claim we don’t have time to cook or go to the grocery store because we don’t make or take the time or we mismanage our time. You know that 30 minutes you spent hitting the snooze button every morning? That’s time enough to prepare your breakfast, lunch and take something out for dinner if meal prepping isn’t your thing. That after church nap or lazy afternoon sitting in front of the TV could be spent in your kitchen prepping and preparing your meals for the week. It only takes a few hours out of your afternoon and it saves time in case you don’t have it during the week. Time is one of the most valuable and abused intangibles that we take for granted. In order to live a well balanced and healthy life, you have to love yourself enough to use your time wisely in making the preparations to do so. 2. Isn’t eating healthy expensive? Eating healthy isn’t expensive if you plan and cook your meals accordingly. I find that eating out is more expensive not only on your pockets but can be damaging to your health based upon making unwise choices due to the lack of time management. For example, let’s look at the average cost if you were to eat out for breakfast, lunch, and dinner including snacks for one day. The average breakfast combo is $5 or more not including if you stop and get coffee from Starbucks which costs anywhere between $4-$6. Lunch can average $8-$10, dinner $10-$15, and snacks/soft drinks from the dreaded vending machine is another $3-$4. That’s an average cost of $35 or more just for one day! Drive-thru and fast food establishments are not your friend because most of the food is processed, high in calories, fat, sodium, carbs and sugars, and you have no control over how most of it is prepared along with the additives and preservatives. Now take that same $35+ dollars you spent in one day and add fresh or frozen fruit and veggies, whole grains, lean chicken, turkey or fish, dairy, and healthy snacks to your pantry and fridge. Not only are you eating healthier, have more control over how your food is being prepared, and saving money, but you have several meals for at least 5 days opposed to just one day. When you initially start eating healthy, you will tend to spend more because you always need to have staple items in your pantry and fridge. That doesn’t happen often until you have to replenish them over a period of time. Not only will you save time, you also will save the unwanted calories when eating on the go. Locally, I shop at Kroger, Aldi’s, Whole Foods and the area farmer’s markets/produce stands. I don’t eat 100% organic because I personally believe you do not have to eat all organic in order to be healthy and it can get quite expensive. I’ve found that some of the local grocery stores have expanded their organic sections and have competitive if not lower prices on the same items found in the bigger all organic grocery stores. For instance, Kroger’s Simple Truth Organic brand is a great option in terms of pricing, quality and taste compared to the other brands found in traditional organic stores. 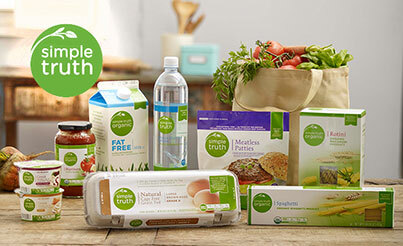 Aldi’s Simple Nature Organic brand and LiveGFree Gluten Free brands are also good affordable options. I’ve tried several items from both of the store’s organic and/or gluten free line and have incorporated them into some of my healthy recipes. Local area farmer’s markets/stands have competitive prices too. 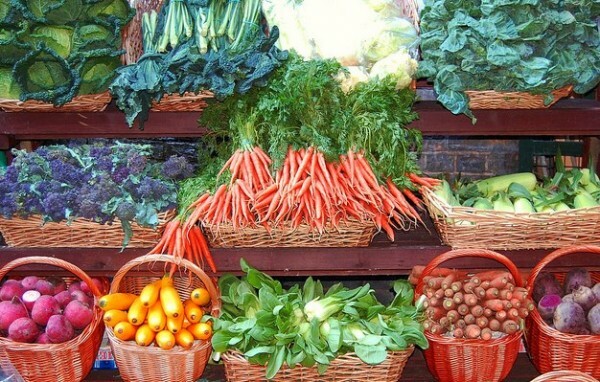 I find that shopping from the area farmer’s markets is actually better for you. Not only are you supporting local area farmers, your food is fresher and most of the nutrients are not lost because of less transport time in getting it to you or your local area grocery store. 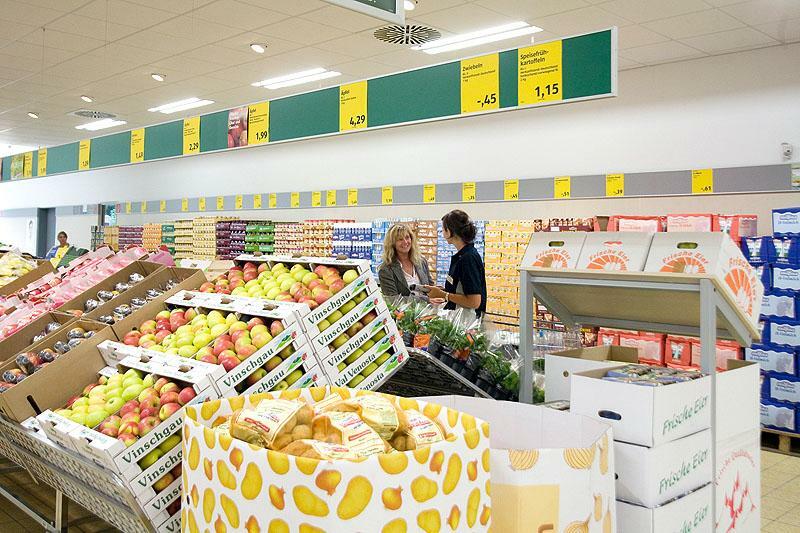 The next time you go grocery shopping, look at the labels on your fresh fruit and vegetables to see where it’s coming from. The longer the distance it is away from you, the less nutrients are left due to transport time. Eating healthier means eating more nutrient-dense foods. Nutrient-dense foods are foods that have a lot of nutrients but relatively few calories. When shopping on a budget, you have to pick and choose where to get certain items depending upon the grocery store and the sale that is going on for the week. I tend to buy most of my groceries from Kroger. I buy my meat in bulk, separate it into single or double servings, ziploc it and pop it in the freezer. Bags of frozen vegetables usually are on sale for $1 and certain fresh fruits and vegetables go on sale from week to week. The same goes for greek yogurt, eggs, cheese, 1% milk and my whole grains. I buy most of my fresh fruits and veggies from Aldi’s and/or the farmer’s market/stand because they usually have fruit and veggies for a very good price year round. Eating healthy doesn’t come with an expensive price. Eating unhealthy does i.e. medical bills, higher insurance premiums, more co-pays, and a reduced quality of life. Would you rather have a higher grocery bill and be in good health or a higher doctor’s bill and be in ill health? The choice is yours. 3. How do I decide upon my weekly meals and do I get tired of eating the same things? If you want to eat healthier, lose or maintain your weight, you have to be willing to find the time in doing what I call the 4 P’s of healthy eating. I plan my meals by filling out my weekly meal plan calendar (which can be found in my Embrace Life Planner coming soon) of the meals and recipes I want to prepare and writing out my grocery list of things to fulfill it. I plan on Friday, shop on Saturday, and prep, prepare and package on Sunday. 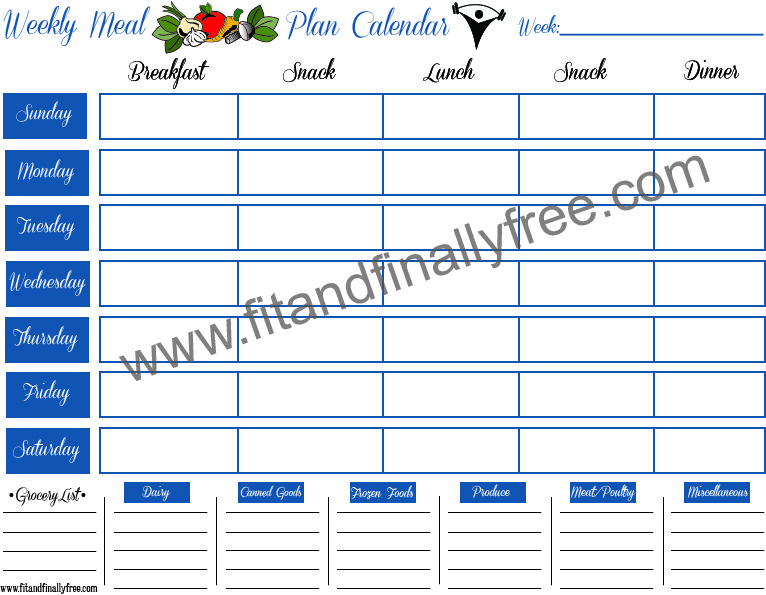 Meal plan calendars help you stay within your grocery budget, have the necessary items to complete your weekly menu, and stay on track from making bad eating decisions due to unpreparedness, fatigue and worry. I look through my pantry and fridge first to see if I have it or not. If not, it goes on the grocery list. I plan for breakfast, lunch, dinner and 2 snacks usually for Monday through Friday. Weekends are my free for all days, but I still try to stay within my healthy guidelines. Your schedule might be different, therefore, pick a day that is suitable for you to plan, shop and cook. Some people do not like leftovers. If that is the case, plan to cook at least for 2 days and on the 3rd day, cook enough for the next 2 days if you are on a 5 day meal prep plan. There are several options in successful meal planning. Find one that is suitable for you and your lifestyle. Having the right tools such as good butcher knives, a cutting board for meat and one for vegetables, measuring cups and spoons, hand mixer, blender, various sizes of ziploc bags, a digital scale, food processor, a variety of seasonings, and containers should be a part of every prep station. 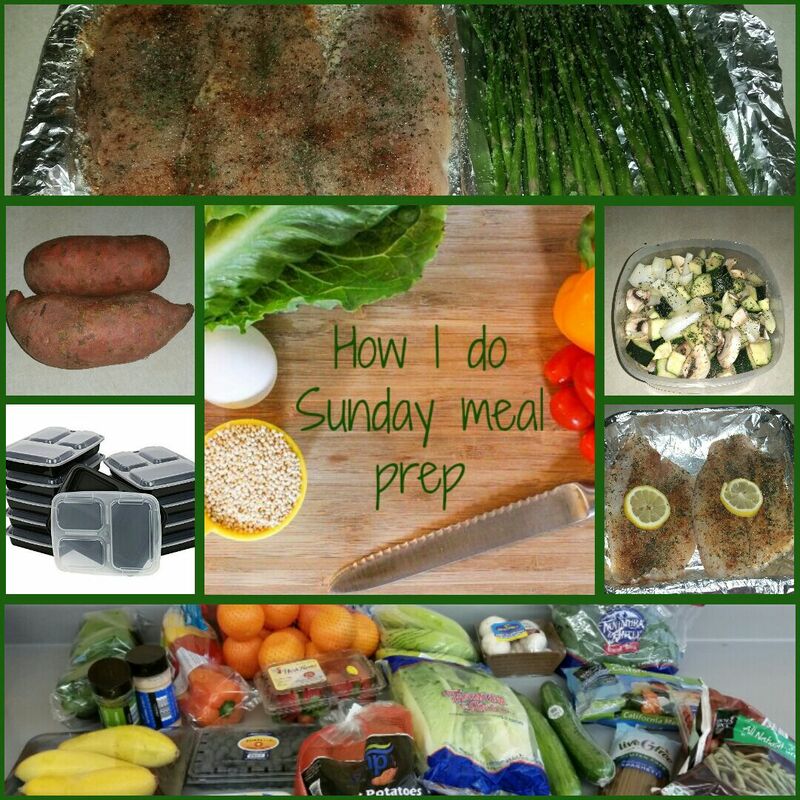 Prepping can be a tedious task, but it is a necessary evil in meal prepping. Prepping your meals should only take about 30 to 45 minutes depending upon the complexity of the recipe, meals and how fast you work. 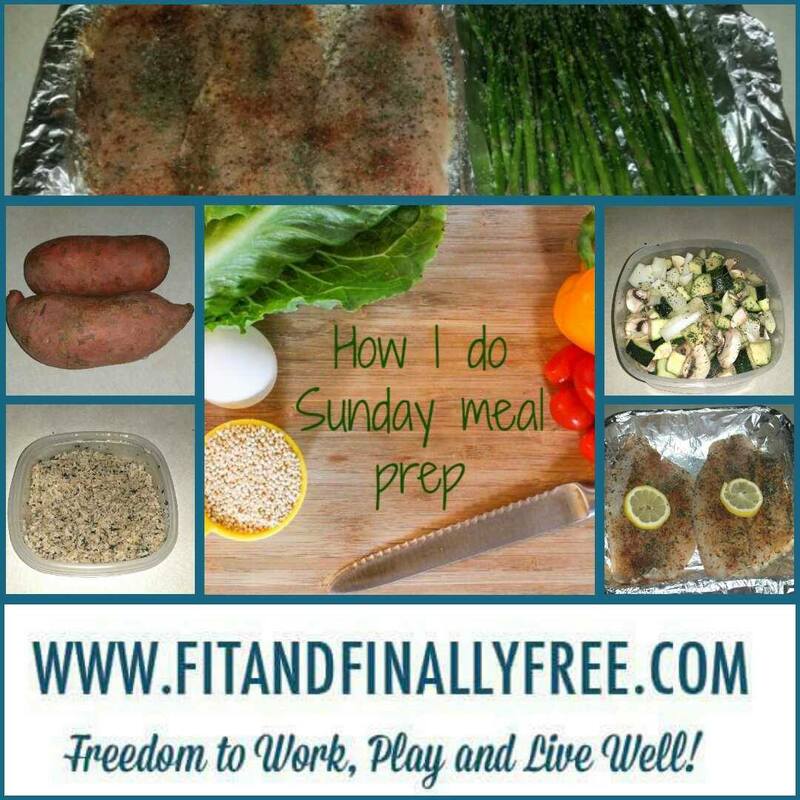 Have extra time the day before your actual meal prep day? Bag up your prepped items and store them in the fridge. That saves time on your actual cooking day. Once you get into the swing of things, it will come second nature to you and it won’t be viewed as a task, but just a part of every day life. Good pots, pans, a George Foreman grill, cooking tray, wok, and cooking utensils should be in every healthy kitchen’s arsenal. I mostly bake, oven fry, saute, roast, steam, boil or grill my meats and vegetables. I do not use any butter, margarine or oils but a variety of seasonings, kosher salt, vinegars, citrus fruit, natural honey, panko bread crumbs, whole wheat flour, gluten free meal, stevia sugar and olive oil cooking spray to prepare my meals. Cooking usually takes about 1 to 1 1/2 hours depending upon the recipe or meal. I always cook at least 2 meats, about 3 vegetables and 2 carbs a week to have a well balanced meal unless its a casserole that might incorporate all three items. By preparing several items, this gives me options to switch my meals up daily hence why I never get tired of eating the same things over and over again. Since starting my healthy lifestyle, I’ve opened my palate up into trying new things, preparations and dishes. I’m always coming up with new recipes or trying recipes to keep things fresh in the kitchen. Once upon a time I hated mushrooms, black olives, artichokes and baked fish. Now, I love eating those things and trying new vegetables and different kinds of fish. You have to train your mind in trying something new, different spices and preparation techniques to help alleviate the boredom of eating the same things over and over again. View it as a new challenge rather than another tedious task of finding something new to eat. Some people question if I cook that much food will it spoil. The answer is no if you have the proper packaging and have your fridge at the right temperature. Of course it all depends on the food too. Like I won’t eat cabbage past 3 days lol. I have different sizes of ziploc bags in sandwich, quart and freezer size, and sectioned air tight plastic containers for my protein, vegetables and carbs. When I go to work or come home, I can just pop it in the microwave like those processed frozen dinners except it’s much healthier. Also, I have other containers for when I store my different proteins, veggies and carbs separately if I don’t use my sectioned containers. Below is just an example of how I use my containers for salads, meals and some of my snacks. 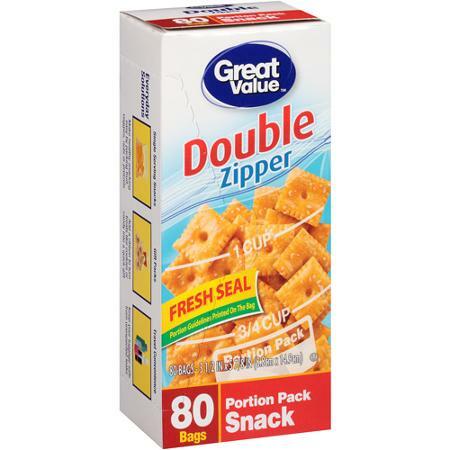 I will put all of my dry salad mix items within a container but will store my wet salad items in ziploc bags. 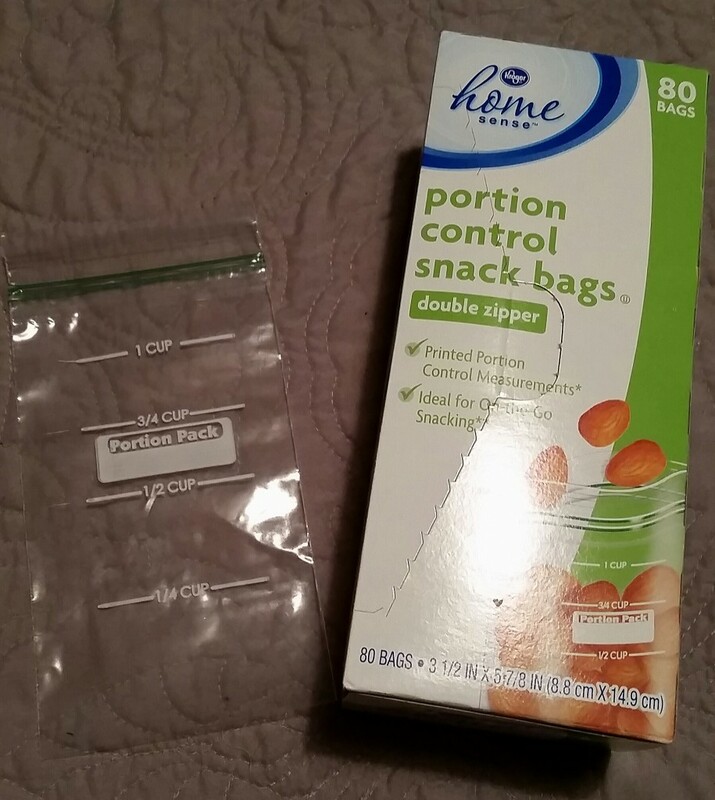 Kroger and Walmart has these new portion control snack bags that are perfect to measure out your snacks or other items you want to store. Planning, prepping, preparing and properly packaging your meals can be simple, healthy, delicious, cost effective, and save you unwanted calories. 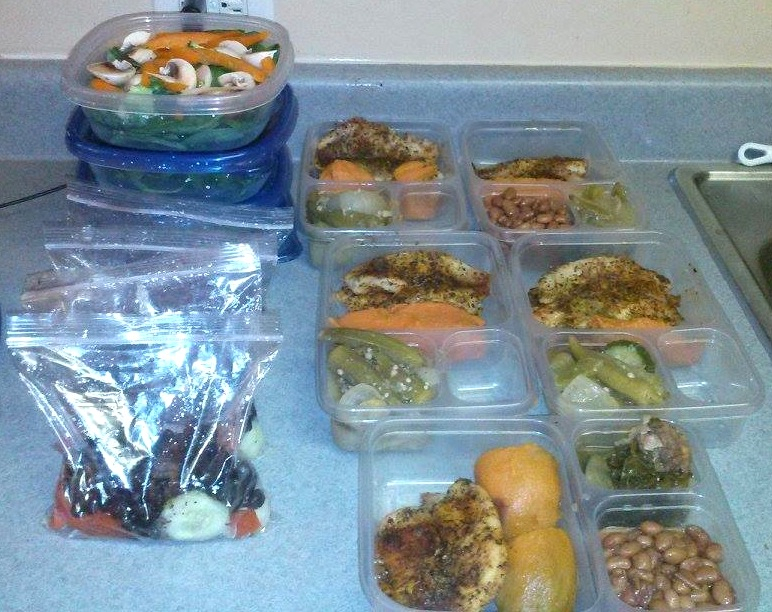 In order to be successful at meal planning, it takes great time management and the desire in wanting to eat healthier. You have the freedom to work, play and live well if you so desire. I’ve given you a few simple tools and techniques in how I live a fit and free life in my kitchen. I’m sure you can do the same. Happy cooking! This is so encouraging and practical. Thanks for sharing Al! Also, you look AMAZING!!! Thanks Ebony for the compliment and liking my post. I try to provide practical nuggets for people who are trying to live a fit and free life. Hopefully, this will encourage others as it has encouraged you. Live and be well! Thank you so much for the detailed information! I have a big family, which includes two teenage girls (who can eat you out of house and home). I decided a while back that we all were going to eat and live better…besides I’m cooking…😏 Your breakdown of everything is so helpful and will carry me far for sure with the success of my family’s fitness and lifestyle changing goals. God bless you as you continue to seek and do His will!